Senator John McCain, who died last Saturday at the age of 81, was, perhaps, the last of a breed among conservative US politicians. Certainly, in the current GOP, usurped by interloper Donald Trump, he was one of a kind. And any Republican politician who is resisting Trump’s divisive assault on the party today is taking his or her cue from Senator McCain. 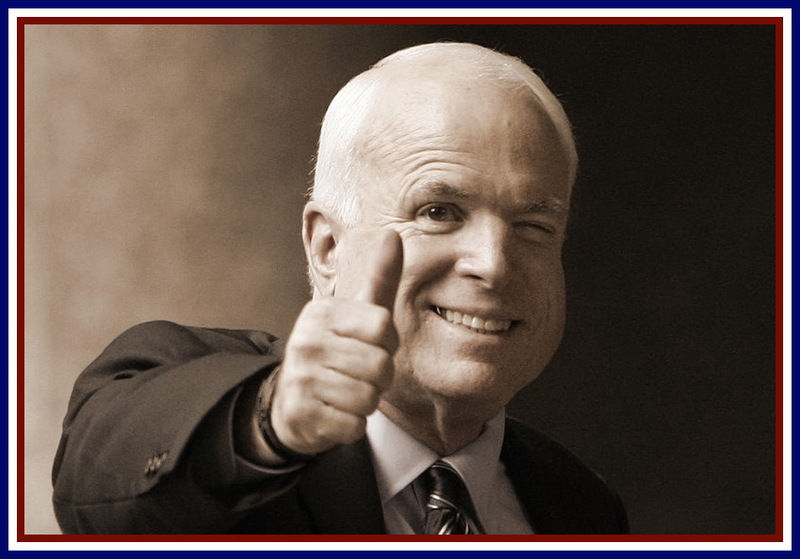 Hopefully, the memory of this unique statesman will serve to encourage other conservatives to resist and to reach across the aisle, as John McCain did throughout his storied political career, to embrace his opponents and seek common ground instead of focusing on their differences. Grandson and son of high-ranking naval officers, John McCain began his service to his country in the mid-1950s, when he enrolled in the Naval Academy at Annapolis. He had been a skilled amateur wrestler in high school, and at Annapolis he took up boxing and became a respectable lightweight. Even then, he was a maverick with a high IQ, who excelled in courses he liked (such as literature and history) but paid scant attention to those he didn’t. As such, he often found himself in trouble with his superiors, but he was looked up to by many of his classmates, and he found even greater favor by using his considerable fighting skills to stand up for underdogs who often became the victims of bullying at the academy. He received his commission as an ensign in 1958, after which he enrolled for two years of training at the Pensacola Air Station in order to become a Navy pilot. His training completed in 1960, McCain was commissioned as a ground-attack bomber pilot. In his earliest missions, he gained a dubious reputation as an often reckless air jockey, who pushed safety to the limit and beyond. As such, he ended up crashing three different military aircraft with sufficient skill to avoid serious injury. By 1967, aged 30, McCain had risen to the rank of lieutenant commander and requested combat duty. He was assigned to fly A-4 Skyhawks off of the flight deck of the ill-fated aircraft carrier USS Forrestal. He and his fellow pilots on the aircraft carrier were to form part of Operation Rolling Thunder, a series of bombing runs initiated out of the Gulf of Tonkin against North Vietnamese targets. McCain was aboard the Forrestal when an infamous fire broke out aboard the carrier, in which 134 seamen perished before the flames could be brought under control. McCain himself had to escape from his aircraft after it caught fire in the advancing flames. It was while he was attempting to help other pilots trapped in the blaze that Lieutenant Commander McCain was seriously wounded by shrapnel from a bomb set off by the fire. With the Forrestal taken out of commission, and once cured sufficiently of his wounds, McCain volunteered to continue to play a part in Rolling Thunder from aboard the aircraft carrier USS Oriskany. All of this happened in that same year 1967, in which Lieutenant Commander McCain would fly 22 successful bombing missions and would be awarded the Navy Commendation Medal and a Bronze Star. It was on his 23rd mission, in October 1967, that John McCain was shot down over Hanoi. He broke both arms and a leg when he ejected from his heavily damaged Skyhawk. He nearly drowned when he parachuted into a lake, but was picked up by a North Vietnamese patrol. The Viet Cong regulars used their rifle butts to break both of McCain’s shoulders and then one of them bayoneted him. After his capture, he was placed in an infamous prison known to GIs as “the Hanoi Hilton”. There, he was refused medical attention and was beaten and tortured repeatedly in an attempt to get information from him. His two cellmates at the time didn’t expect him to live. But against all odds, he did. He was only given medical attention after his captors found out that he was an admiral’s son. Word of his being shot down spread quickly in the international press. In early 1968, McCain was placed in solitary confinement, where he would remain for nearly two years. At one point during that time, after his father became commander of US forces in the Vietnam Theater, the Viet Cong offered to release McCain into US Navy custody. This was a propaganda ploy that, on the one hand was designed to demonstrate how merciful the Viet Cong military was toward its enemies, and, on the other, to show other US POWs that the privileged sons of high ranking American officers were willing to use their influence to gain early release. However, in strict adherence to US articles of war, which prohibit American service personnel from accepting special parole or privilege from the enemy, Lieutenant Commander John McCain refused to accept release unless all other POWs were released with him. As a result, he was subjected to unspeakable new horrors, in which he was taken from his cell and beaten regularly every two hours for an indefinite period of time. During this period he lost 50 pounds and as his health began to fail, he contemplated suicide. His attempt to kill himself was foiled, however, by prison guards and the torture continued. Eventually, McCain realized that he had reached his breaking point—every person has one, and certainly his was far and away a very high bar. He signed an anti-US propaganda statement. Surely, no one (with the exception of Donald Trump) has ever blamed McCain for finally folding when life had become unbearable and suicide impossible. No one, that is, except John McCain himself, who always considered the signing of that false “confession” a “dishonorable act”. To make up for it, McCain refused to sign any further propaganda papers and as such, was again subjected to regular beatings several times a week. It wasn’t until 1973, after more than five years in captivity, and in the waning days of US participation in the Vietnam War, that John McCain was released. The injuries that he suffered in captivity would plague him for the rest of his life. Among other things, he was never again able to raise his arms above his head. Despite that fact, after going through long and harrowing physical rehabilitation, he was eventually reinstated as a Navy aviator and was given command of a flight training group in Florida. Having achieved the rank of captain, John McCain decided to retire from the Navy in 1981. He was granted a disability pension. Over the course of his distinguished military career, McCain received a Silver Star, two Legion of Merits, three Bronze Stars, two Distinguished Flying Crosses, two Purple Hearts, two Navy and Marine Corps Commendation Medals, and a POW Medal. But John McCain was best known for his political career. As a congressman and senator for the state of Arizona, McCain spent 36 years in the US Congress. His colleagues, almost to a man and woman, and on both sides of the aisle, recognize that, whether you agree politically with John McCain or not, everything that he has done throughout his political career has been, to the best of his knowledge, what he thought was “the right thing to do.” He has been a hard-core opponent of those who disagree with him, but he has also been quick to admit to mistakes and errors of judgment. He has also been a consummate statesman, who has sought results over party line. From Ted Kennedy to Barack Obama, and from Hillary Clinton to Chuck Schumer, he is remembered as a tough opponent but one who, when it came time to seek results, was willing to sit down and negotiate from a position of common ground rather than stonewalling on points of contention. This willingness to see the other point of view even while sticking to his convictions is clearly what permitted a staunch Republican like McCain to forge a deep and lasting friendship with a committed Democrat such as Joe Biden. John McCain was, perhaps, the last of the Eisenhower-type Republicans. He believed in country above party, decency above advantage, fairness above winning, despite his combative nature and his adherence to his own strict code of ethics. The statement shocked the majority of Americans, but rolled off the backs of Trump’s blindly loyal base like water off a duck’s back. Many, including myself, thought such an attack on an American military and political icon would end the career of a recently born-again Republican interloper in McCain’s own party, but we were all wrong about that. A significant segment of the population that was no longer interested in the values that McCain so clearly embodied—honesty, truth, justice, democracy, duty, honor and country—would carry Trump to a narrow victory in which he lost the popular vote by three million votes, and the GOP would suffer a humiliating setback in its erstwhile incarnation as the party of Lincoln, the party of Eisenhower and the party of John McCain. Trump cannot find it in his heart to be generous toward John McCain even in death. A terse tweet sending condolences to McCain’s family was clearly going to be the president’s only concession to a man whose selfless service to his country spanned six decades. This despite the reported urging of Chief of Staff Kelly and other White House insiders that Trump release a eulogy statement written for him. Instead, the president jetted off to play golf. And on his return, he ordered the White House flag, which flew at half-mast over the weekend, to be returned to full mast. Too little too late, the president’s attitude speaks volumes of how different from John McCain’s his brand of “Republicanism” is—politics without honor, without truth, without chivalry, without concession, without sacrifice, and without patriotism.